The acrylic yarn braids are joined by sturdy, invisible stitching. The rug is finished with a braided border on two sides. 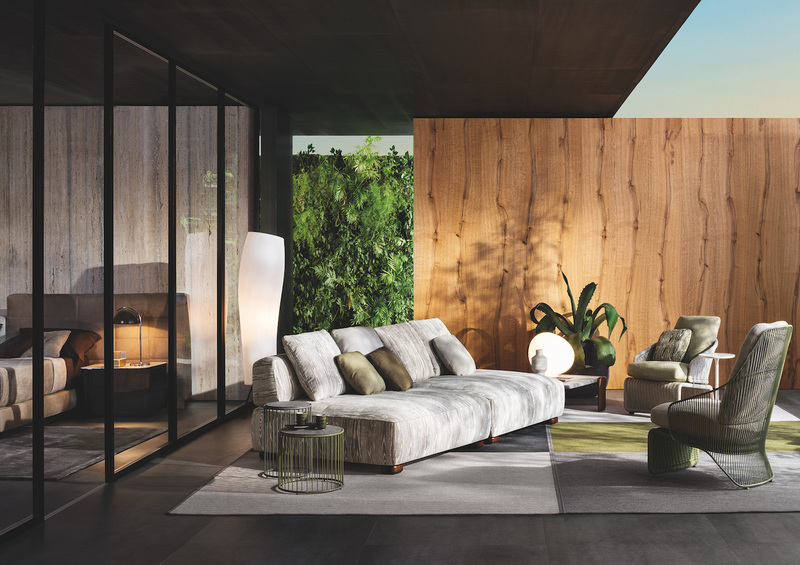 The Braid “Rug” comes in four shades – Pewter, Forest Green, Ecru and Chocolate – that coordinate with the most popular kinds of outdoor paving and with the materials and fabrics in the new collection. The characteristic base made of welded metal tubes comes with a glossy painted finish in the following colours: Clay, Sunflower, Rust and Khaki Green. 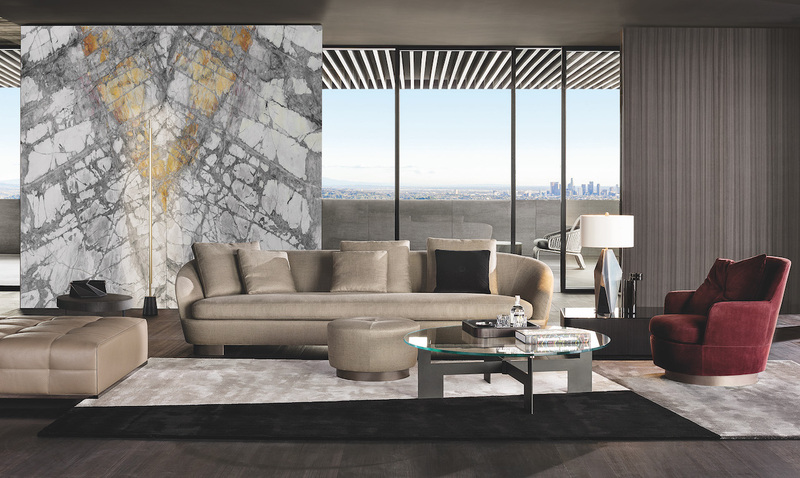 The round top with contoured edges is available both in Pietra del Cardoso stone and Silver Beola stone. 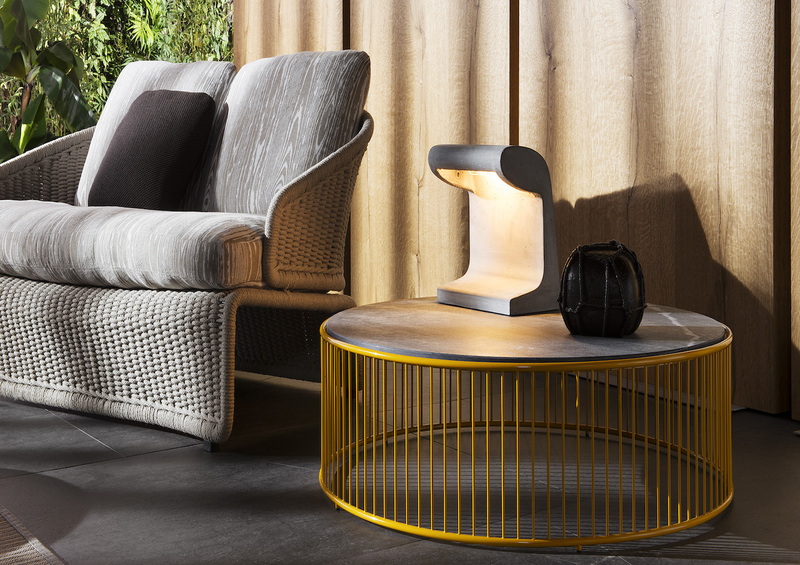 The Caulfield coffee table is now available in an outdoor version with an innovative combination of materials. The airy metal structure comes in a palette of eye-catching colors – Clay, Sunflower, Khaki Green and Rust. The metal structure is first sandblasted to remove any imperfections and then epoxy powder-coated to ensure optimal resistance to corrosion and weather. The top is in Pietra del Cardoso stone, with a brushed finish. The Caulfield “Outdoor” coffee tables come in three sizes. The metal structure is first sandblasted to remove any imperfections and then epoxy powder-coated in the following colors: Clay, Pewter, Sunflower, Khaki Green and Rust. The metal structure is completely covered in special polypropylene fiber that is similar to traditional woven wicker and comes in an array of sophisticated colors: Sand, Elephant Grey, Charcoal, Sunflower, Khaki Green and Rust. The epoxy-painted finish on the metal structure is color-coordinated to match the cord. It is in Pewter color when the cord covering is in Elephant Grey or Charcoal, and is in the same shade as the cord for the other colors: Clay, Sunflower, Khaki Green and Rust. The cushions have internal padding in high resilience expanded polyurethane foam and are covered in water resistant fiber and fabric. 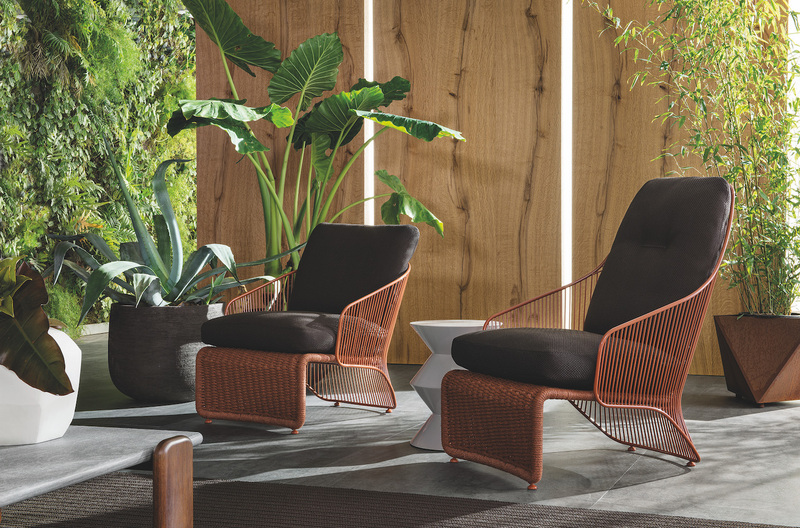 The completely removable upholstery covers come in a vast array of outdoor fabrics that look sensational when combined with the cord structures. The Halley “Outdoor” collection also includes a daybed that is as elegant as it is comfortable. The structure is covered in cord in the following colors: Sand, Elephant Grey, Charcoal, Sunflower, Khaki Green and Rust. The cushions have internal padding in high resilience expanded polyurethane foam and are covered in water resistant fiber and fabric. 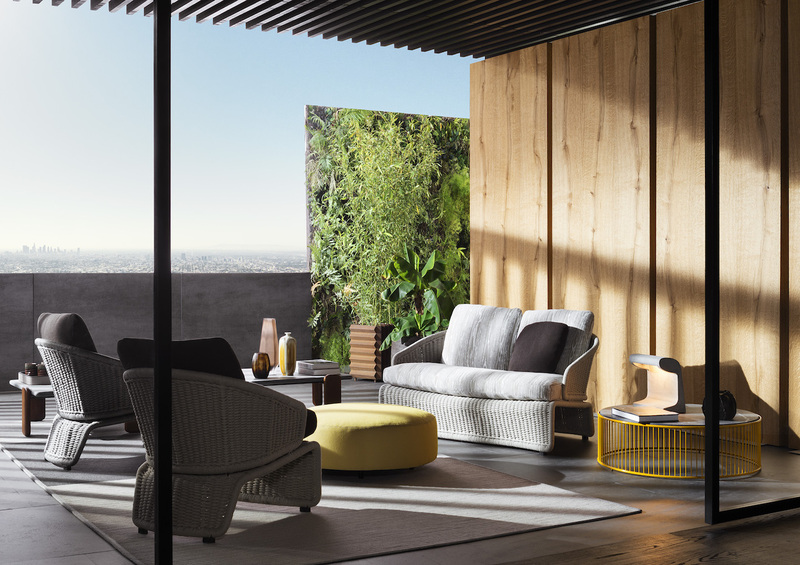 Thanks to a mechanism designed and engineered by Minotti Studio, the Halley “Outdoor” daybed can be adjusted to four different reclining positions. The enveloping shape of the metal backrest accommodates a soft cushion that makes the Colette “Outdoor” armchair even more comfortable. The profile of the metal structure is calendered, assembled and welded in more than 300 places. The metal structure is first sandblasted to remove any imperfections and then epoxy powder-coated to ensure optimal resistance to corrosion and weather. The structure of the seat ends at the front in a support structure wrapped in cord made from a special braided polypropylene fiber, available in four colors: Sand, Sunflower, Khaki Green and Rust. The epoxy paint for the metal structure comes in the same shades as the cord Clay, Sunflower, Khaki Green and Rust. The Colette “Outdoor” armchair is available in two heights and can be paired with the ottoman of the same name. 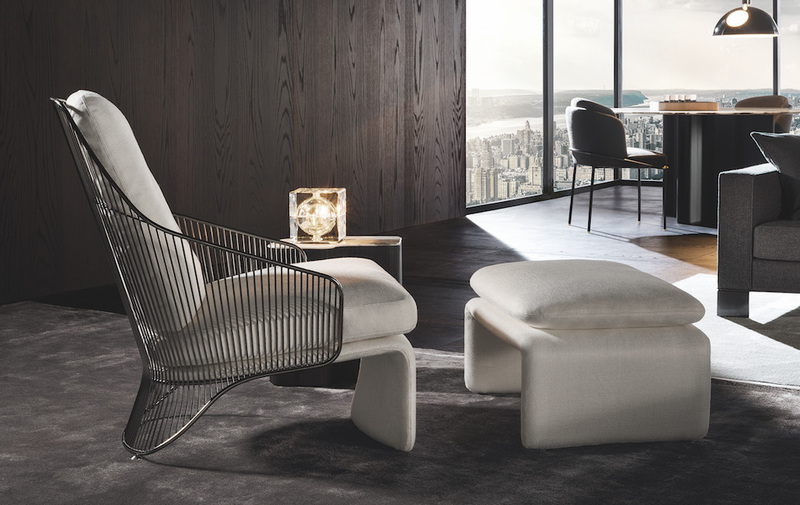 Guaranteed to turn heads, this armchair takes its inspiration from the iconic period of mid-century elegance and skillfully blends experimentation in the design of shapes with sophisticated decorative taste. The construction of the Colette armchair is fairly complex. The profile of the external structure in metal is calendered, assembled and welded at more than 300 points. The special metallic finish is achieved through galvanization in a white-gold bath, followed by application of a transparent protective coating that lends durability and depth. The structure of the seat terminates at the front in a support structure and is made of polyurethane foam with metal insert, and elastic straps to ensure the utmost in comfort. The contoured seat cushions and seat back allow them to mold perfectly to the structure. The Colette armchair comes in two heights and two finishes: Light Gold and Black-Nickel. 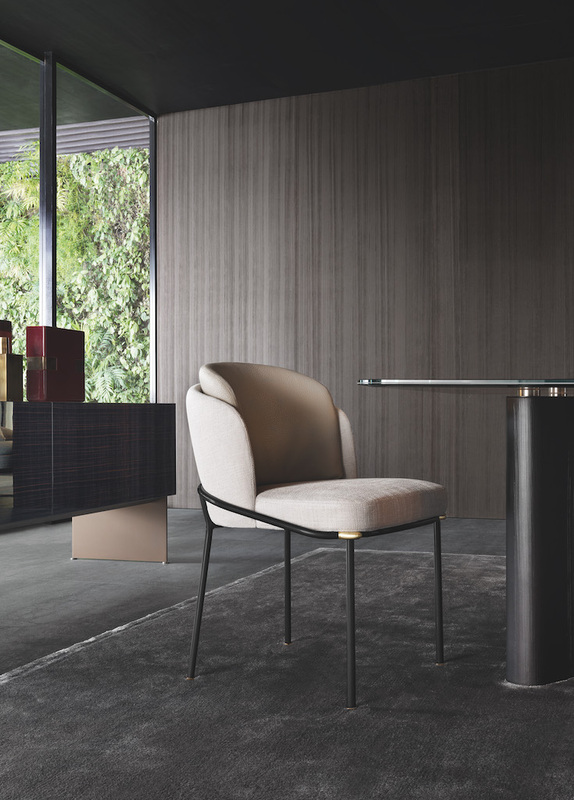 With luster as refined as it is understated, the Colette armchair introduces a note of sophisticated extravagance to any room, not unlike the way cuff links on a shirt add a touch of refined elegance to a business suit. 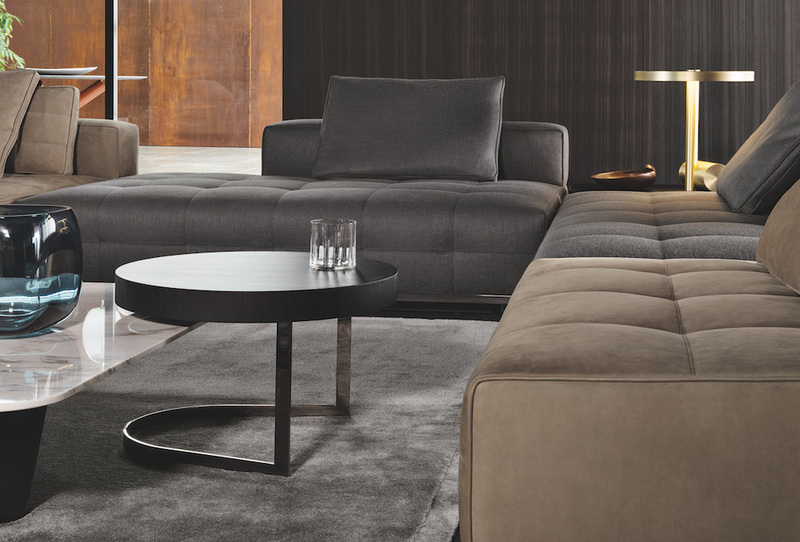 Pollock is the quintessential sofa, as designed by Minotti. With a contemporary eye, the Pollock seating system revisits the aesthetic values that distinguished the eponymous seating system, a company best-seller at the end of the ‘90s. The original high foot in metal with its distinctive design and the proportions of its shapes, outlined in elegant piping, lend decorative appeal that is perfectly poised between classicism and modernity. Thanks to die-casting technology, the design of the foot softens into more sinuous lines while the Pewter color finish accentuates its refined elegance. A subtle quilted motif enhances the Pollock seat cushions and exemplifies how a talent for tailoring is an integral part of the company’s DNA, and evident in every detail of construction. 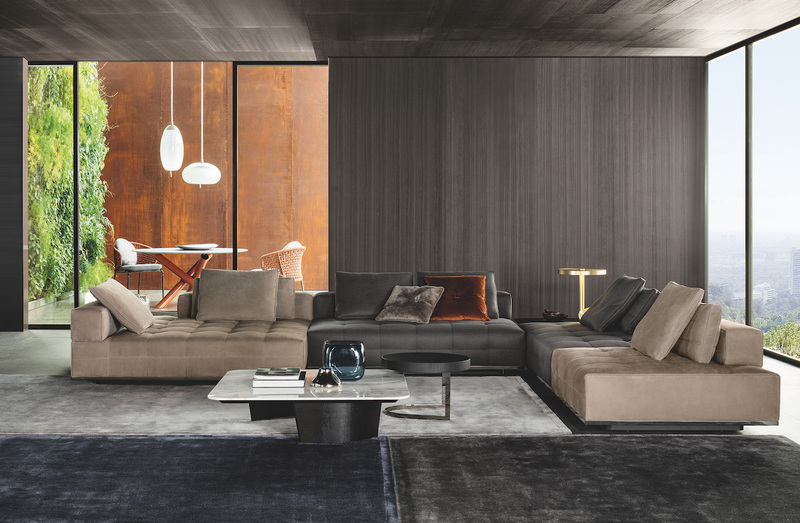 Pollock is an extremely versatile sofa that can play a starring role in any setting and be dressed with cool elegance in all the fabrics and leather options the exclusive Minotti collection. The padded structure is made of a cold-formed foam shell covered in soft padding and rests on a base available in two finishes: solid ash with open-pore Chestnut stain or solid beech with glossy lacquer finish in Sand, Granite or Mud. The option to choose the base, and the many different upholstery selections available for the seat, make Amélie an especially versatile chair that can lend understated elegance to any type of decor. The Amélie little armchair comes in versions with fixed or swivel base and can be paired with all the tables in the collection. The Amélie chair is available both in the Dining and Lounge options. 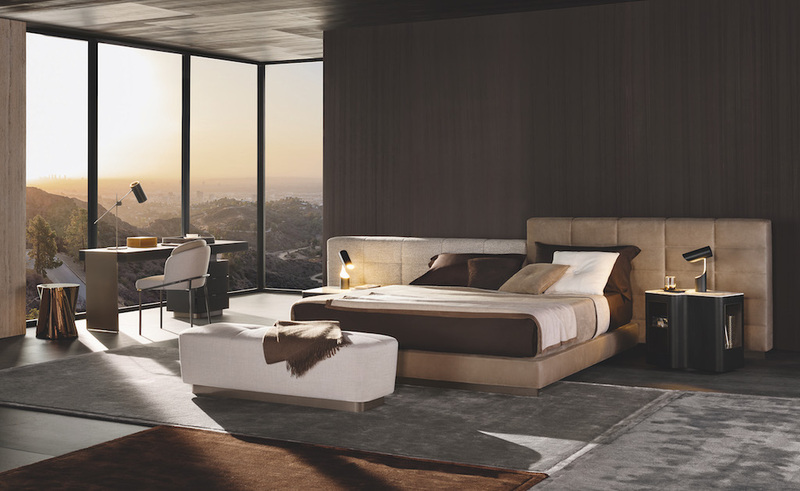 The padded headboard is divided into two separate elements that come in two different heights and widths, opening the door to creative freedom in designing symmetrical and asymmetrical configurations and making bold choices in upholstery combinations. The Lawrence Bed headboard upholstery is completely removable and features elegant stitching in a modern, graphic pattern of squares. 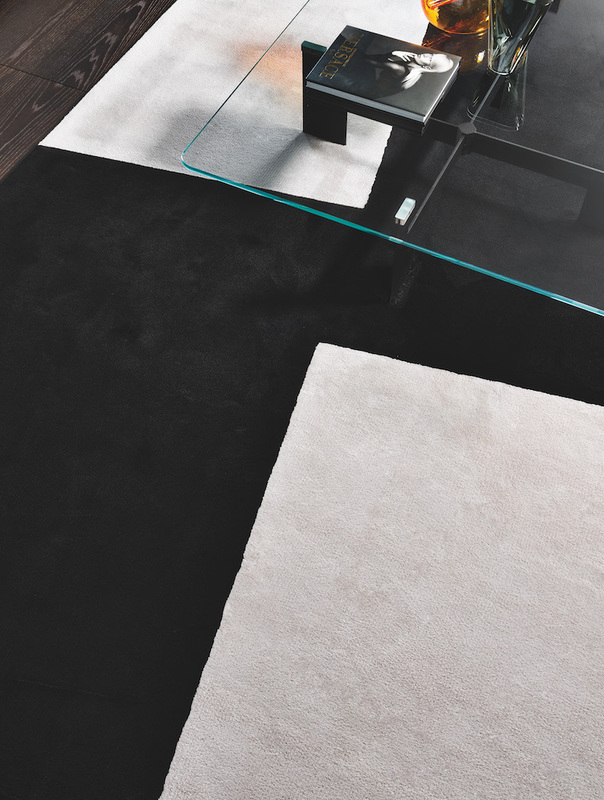 The Dibbets “Rim” rug features a 5-cm-high perimeter border. 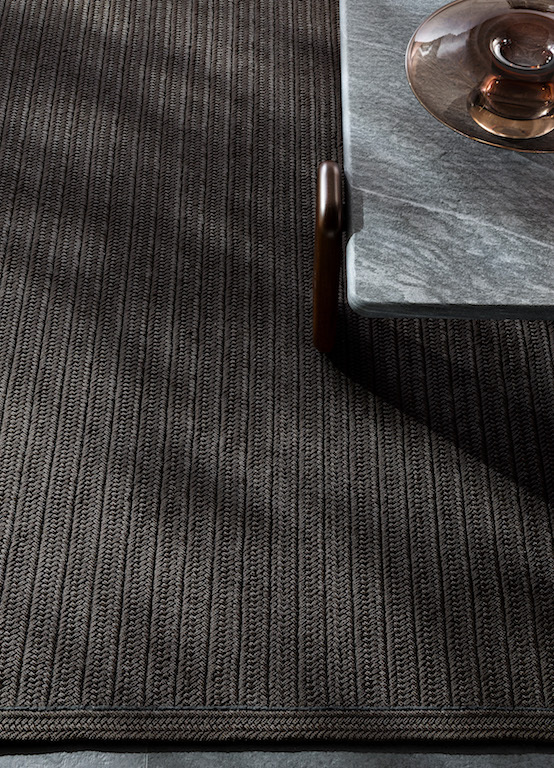 The difference in height between the border and the interior of the rug creates a striking effect of depth and accentuates the natural softness and brilliance characteristic of Lyocell, a fiber made from cellulose. 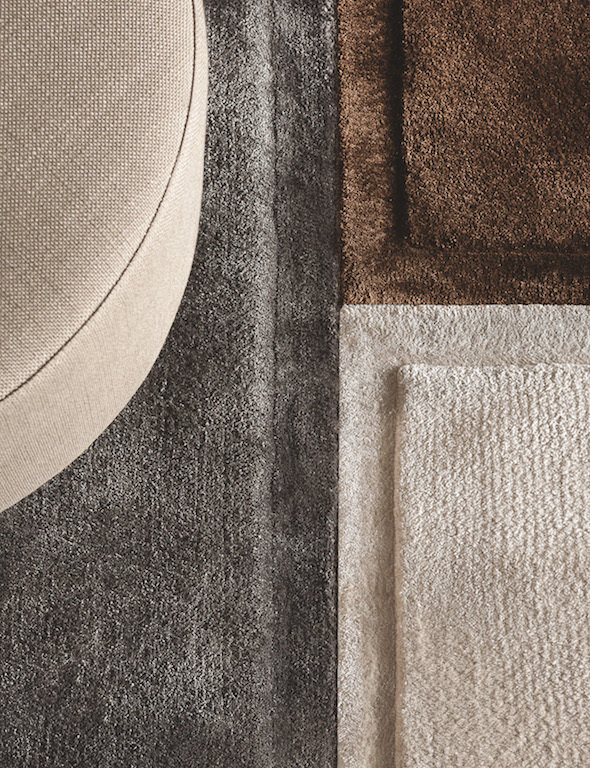 The Dibbets “Rim” rugs are produced using artisanal, hand-tufting methods. They come in three sizes and a broad range of colors, chosen to complement the 2017 textile collection. The abstractionism movement in art inspired the concept of the Dibbets “Diagonal” rugs. Geometric backgrounds in contrasting or tone-on-tone colors intersect to create stunning designs. The Dibbets “Diagonal” rugs are made of Lyocell, a cellulose-based fiber, and are produced using artisanal, hand-tufting methods. 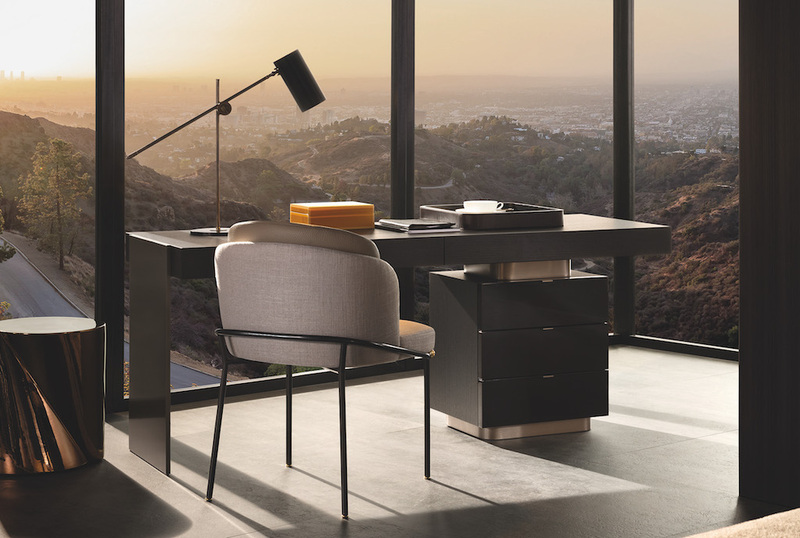 The collection of Carson cabinets, with its pure, modern aesthetic, gains two new elements – a bookcase and a desk – as well as a new ebony glossy lacquer polyester finish. 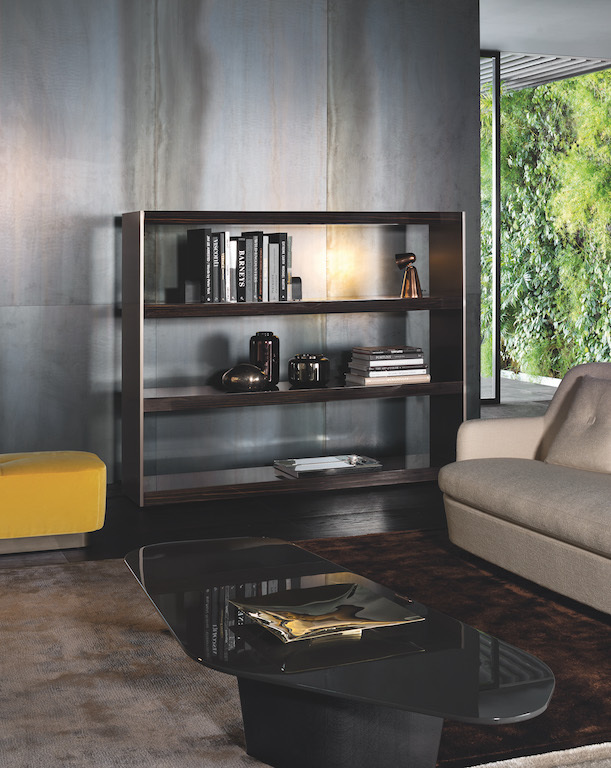 The sides of the bookcase are made of satin-finish metal with Light Bronze finish while the 7cm shelves are in ebony veneer with glossy lacquer polyester finish. The bookcase, like all the elements in the Carson collection, is also finished on the back and therefore can also be used as a room divider. 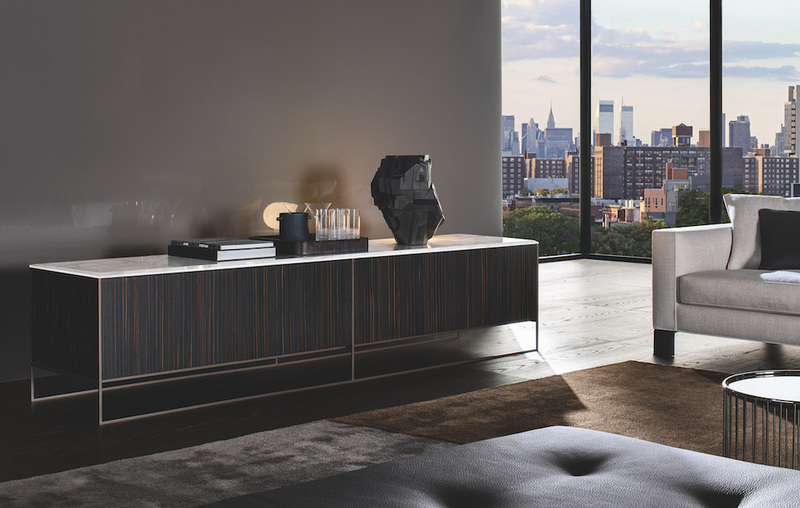 The series of Calder “Bronze” consoles, featuring pure, uncluttered lines, expands to include a family of sideboards. The choice of elegant, luxurious materials contrasts the studied simplicity of the design. The structure is in satin-finish metal with Light Bronze finish. The sides and doors are in ebony veneer with open-pore opaque lacquer finish, while the beveled top is in Calacatta marble. 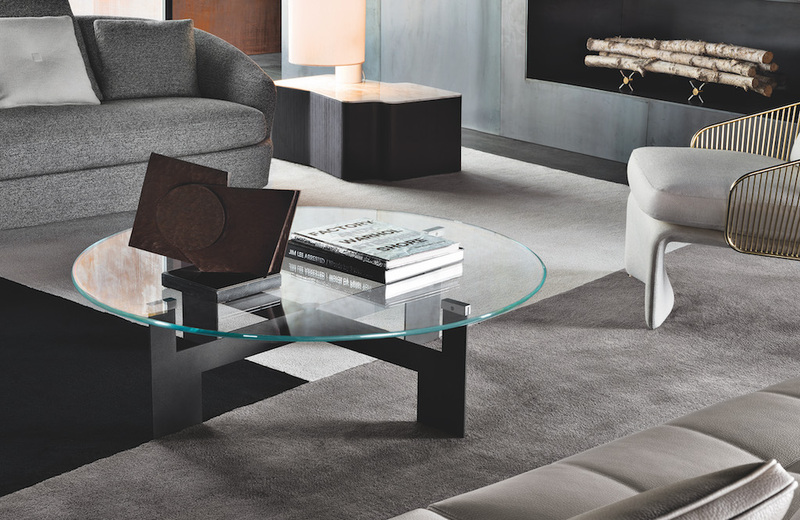 The Diamond “Lounge” table displays a unique diamond shaped top with beveled edges. 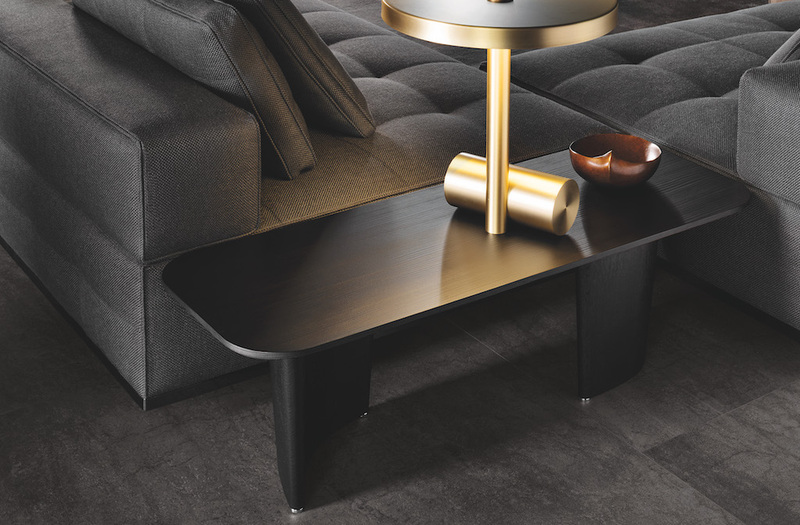 The base of the coffee table is in tubular metal with polished Light Bronze painted finish while the contoured top is in Moka color backpainted glass, laminated to a circular wood top with glossy Bronze lacquer finish. The minimalist design of the structure is achieved through the subtraction of material and is then interpreted in two very different metal finishes – polished Light Gold that, with its elegant sheen, introduces a sophisticated decorative note to any setting; or Black-Nickel, for a more formal, understated look. The combination of materials is unique, with round table tops that can be made in Black pâte de verre glass or in ash with open-pore Black lacquer finish. The Caulfield coffee tables come in four different sizes and coordinate beautifully with all the chairs in the collection. The tops in extra-clear glass with rounded edge draw attention to the design of the metal base with embossed Black painted finish. 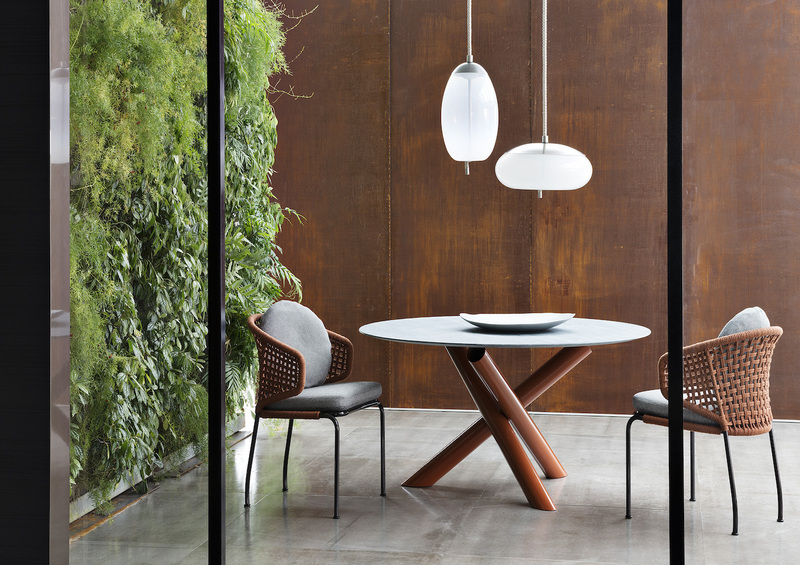 The understated support is in metal with Black-Nickel finish, while the substantial table-top surface is made of brushed larch with stained Licorice or Dove Grey color finish. 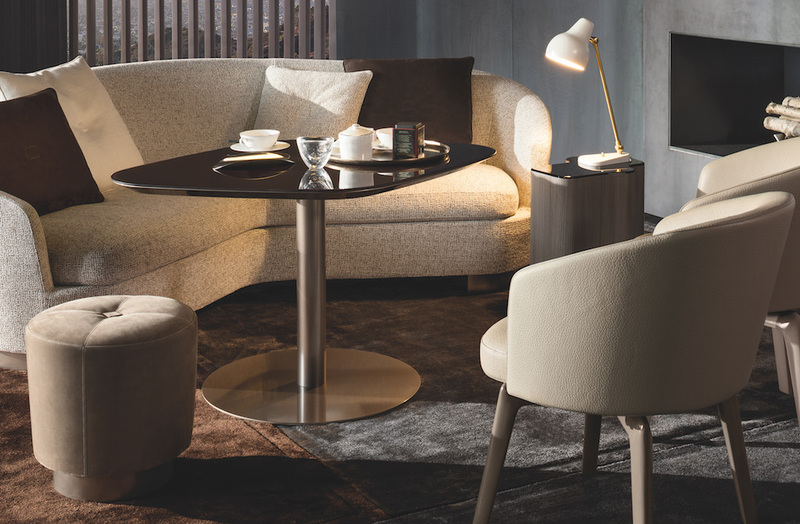 The Kay coffee table comes in two heights, multiplying its possible uses – as a complement to the sofas and armchairs, or as components for a unique layering effect with other coffee tables in the collection. 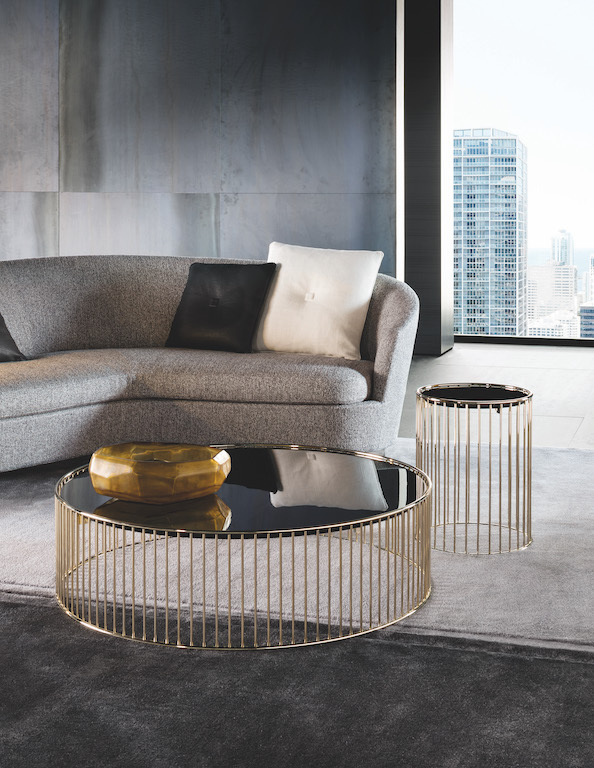 Two truncated cones merge into a single, unique shape to form a coffee table whose iconic personality is further underscored by the selection of two metal finishes: Bronze and Platinum. A little armchair that beautifully blends formal elegance and great comfort, thanks to its metal and polyurethane foam structure. A cushion made of flexible thermoformed material and polyurethane foam lends additional softness to the backrest. The padded structure rests on elegant, slender legs in matt Black painted metal tubing, embellished with details in polished Gold finish. The Fil Noir chairs take their name from thread – an unmistakable sign of continuity. The thread, or tube, that actually makes up the body and substance of the chair – not only outlines its silhouette, but also supports and envelops it. A thread that expresses a core decision in the choice of material. Metal tubing painted matt black. A choice of absolute austerity that is softened by the rings with polished Gold finish that set off the corners of the chair, adding a note of decorative contrast to the stark formality of the structure. 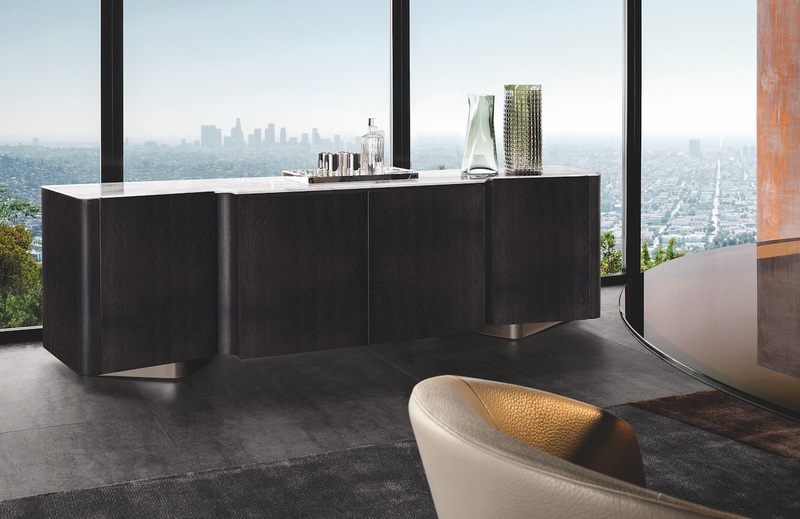 The sinuous shapes that set the Lou collection apart are revisited in the design of the horizontal sideboard, designed as the perfect companion to the table. The fine art of cabinetmaking is evident in the elegant workmanship and refined finishes. 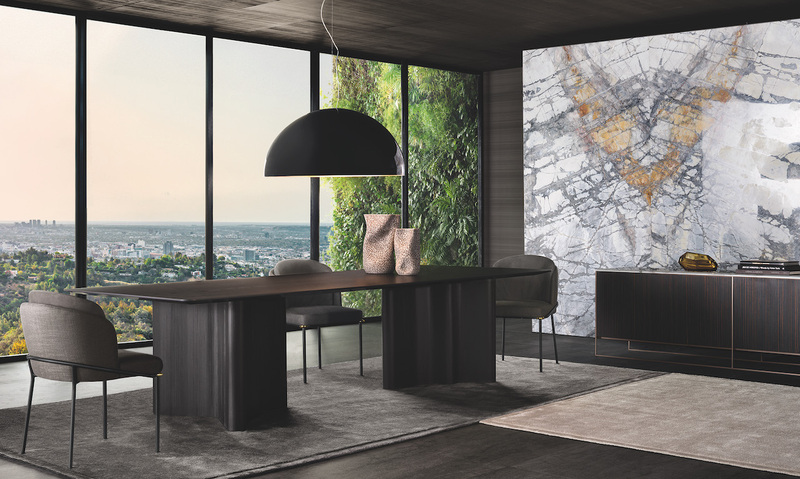 The structure of the Lou sideboard is in ash with open-pore lacquer finish in Licorice color that creates a sophisticated contrast with the top in luxurious Calacatta marble and the base made of Light Bronze color metal with satin finish. All of the seating elements share the enveloping lines that offer a pleasant sensation of welcoming warmth, thanks to the soft cushioning in the seats and backrests. Structural perfection and flawless tailoring underscore the high level of expertise achieved by the company over the years and are the consummate expression of its masterful craftsmanship. The “Grand Jacques” sofa is perfectly balanced between traditional and contemporary styling. Distinguished by an enveloping structure that continues along the contour of the armrest, it is constructed with a single seat cushion. The depth of the sofa was designed to host numerous cushions, lending the sofa a luxurious appearance and a contemporary decorative allure. 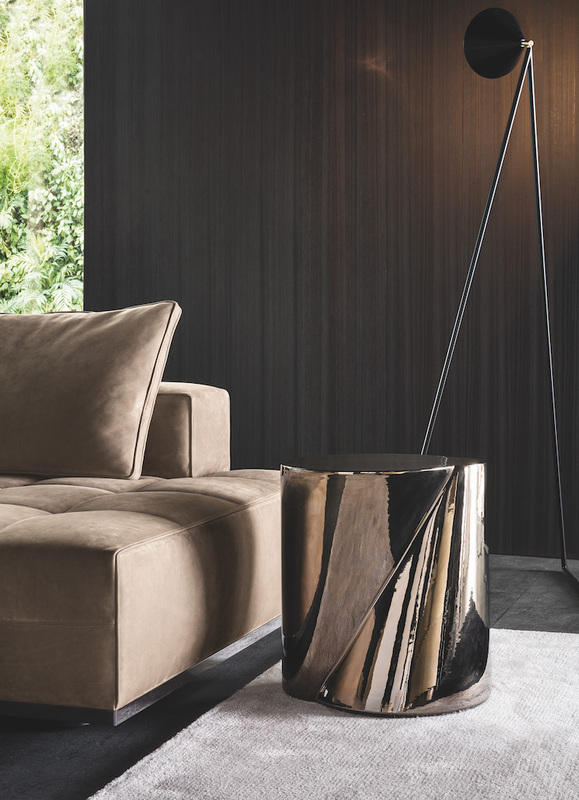 The metal base with Light Bronze finish lightens its generous proportions, lifting the sofa off the floor so it seems to float when viewed face-on. The curved, Light Bronze metal blade supports are clearly visible from the side. The restrained height and curved lines of the “Grand Jacques” sofa also make it a natural for positioning in the center of a room. 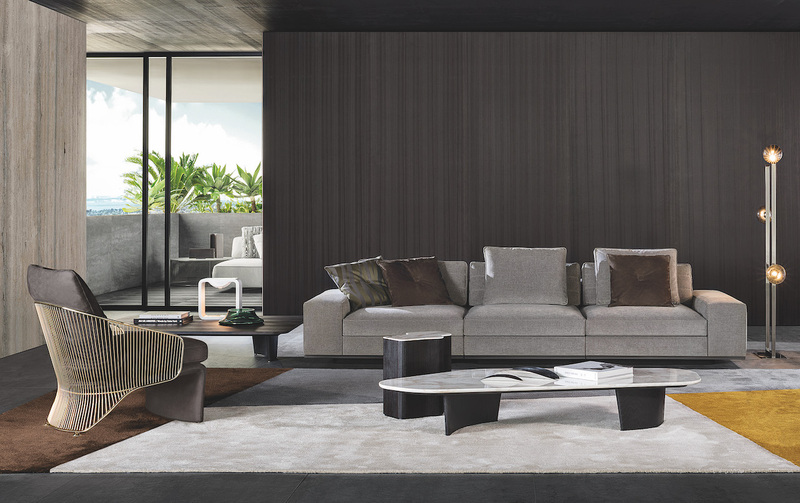 With their well-defined shapes, the “Clan” elements lend themselves to compositions that express a more dynamic and informal interpretation of the living room. The one-piece seats feature stitching in graphic, modern square-shaped designs. This refined tailoring detail epitomizes the company’s skill in drawing upon tradition to bring new vitality to an ancient technique like embroidery, through an unhesitatingly contemporary interpretation of style. The elegant metal perimeter frame with Black-Nickel finish emphasizes the formal aesthetic of the Lawrence sofa, while a set-back perimeter base in metal alloy with painted black finish supports the sofa and gives it the appearance of floating above the floor. This eminently sophisticated detail also performs the function of protecting the lower part of the sofa. Lawrence is the quintessential expression of bespoke design, a quality inherent to every product the company makes. It takes inspiration from the infinite care that goes into making the finest leather goods. The refined stitching that embellishes the Lawrence seating systems exemplifies refined taste and is the product of highly-skilled artisan craftsmanship that blends technical excellence and an enlightened appreciation of tradition. Savoir faire and creative inspiration produce the highest quality items whose value is enhanced by the use of Cervo leather, a natural, luxurious material, distinguished by extraordinary softness and unmistakable grain.